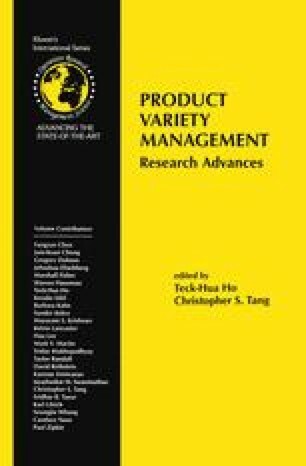 Postponement — delaying the point of product differentiation in a production process — has been found to be an effective strategy in face of increasing product variety. One value of postponement is flexibility. While the product is still in its generic form, the manufacturer can observe the latest demands for the different end-products and, at the postponement point, determine how much to customize the generic product for each end-product form. Hence, the value of postponement comes from the resolution of uncertainty of demands up to the postponement point. Another value of postponement is that the forecast accuracy for the demand of the final products in the distant future can also be improved. In this case, postponement enables the decision concerning the final customization of the end-products to be made at the time when the demand forecasts of the end-products are improved. We quantify both values of postponement in this paper, and discuss their relative magnitudes as product variety increases.